When I got up today and checked my email, I found a "Google alert" about a TMNT-related story, and clicked on the link. 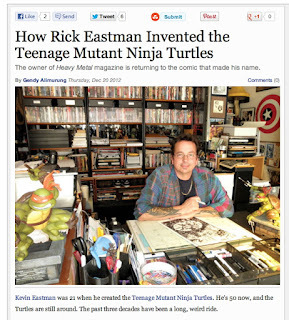 It was mostly about Kevin Eastman and his history with the Turtles -- not a bad article, a little slapdash and loose with some of the facts, but containing a few charming details from Kevin about his childhood. But the silliest -- okay, let's be honest -- the STUPIDEST thing about the piece could be found in the headline for it, as you can see by this screen grab I made. I've had enough experiences with journalists and editors to know that a lot of them are either (a) rushing to make deadlines and thus prone to making dopey errors, and/or (b) just freakin' lazy. 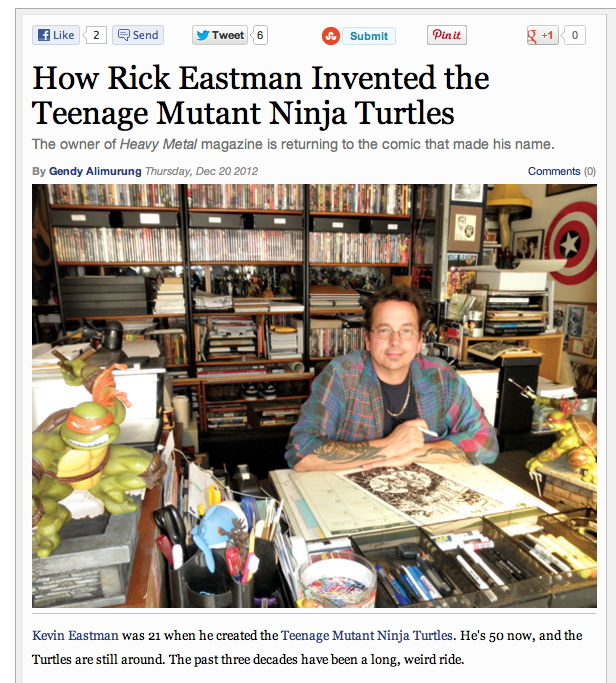 I mean, really, how do you justify a headline identifying the subject of the piece as "RICK Eastman" when the FIRST TWO WORDS OF THE PIECE correctly identify him as "KEVIN Eastman"?